Significant changes in surgical training have occurred over the past decade, with the inevitable progress towards specialization in the various surgical specialties. The current edition of Essential Surgical Practice: Higher Surgical Training in General Surgery reflects these latest developments with a new structure that accurately mirrors current surgical training. 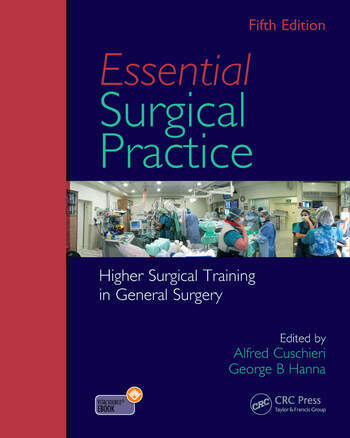 This new edition excludes surgical specialties that are distinct from general surgery, allowing an increased focus on topics of direct relevance to trainees in higher surgical training. This book can be used with confidence by those enrolled in local courses and is also consistent with the scope and level of information required for international postgraduate examinations, such as the Joint Surgical Colleges’ Fellowship Examination. To enhance the book’s utility, the print edition includes complimentary access to a VitalSource ebook online and offline on your PC or Mac, iPhone®/iPod Touch®/ iPad®, Kindle Fire or Android™ device. "… a very well presented, high-quality book…The format of this book, with its smaller sections and topical headings, makes it less dry and kept me not only awake, but interested." "I have little doubt it will remain a popular reference book, and rightly so. The text is comprehensive yet succinct, and is laid out in a style that permits relatively easy and focused reading."